I stopped into the BK to grab a Whopper J for a buck, and as I was strolling up to the entrance this faded old Mercedes diesel comes clattering up. Any other make of car, I would have called it "ratty". But even in it's battered condition, a Mercedes has class. "Tattered", perhaps, might be a good word. Motor still clacking away, the big door swings open and out springs Tony. Tony, a wiry kind of a guy, hefts open the enormous hood, reaches in, flips a switch that kills the engine, and slams the hood, like this is the way everyone shuts off their car at the Burger King. I knew I had to talk to this guy. "Yeah, I could fix that, but..."
I'm sure he could fix most everything on this car, but this Mercedes is Tony's "work car". As you can see, it works hard. The 1983 Mercedes 300D has well over 200,000 miles on it, 280k, I think he said. Tony says it's the most reliable car he's ever owned. I had to grin. As we ate, Tony told me he worked for many years as a mechanic but just got tired of it. Now he's doing electrical work. 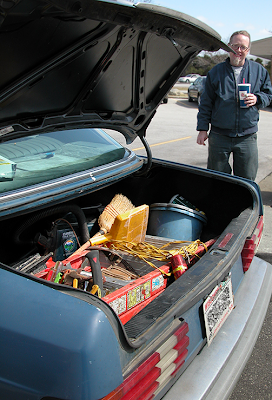 Hence the trunk full of tools. For grins, he collects air-cooled, two-stroke Yamaha motorcycles of a similar vintage as the Benz. He said he thinks at one time he may have had fourteen of them. This summer, he thinks he might get back into drag racing the bikes again. Spring will do that to ya. My dad recently parted with his 1982 300sd, with about the same mileage. It was gold, shiny, beautiful, like new. He loved that car and took such amazingly good care of it -- we never thought he would part with it, but alas, the time had come. My sister as a teenager (now a seasoned mother of two) used to feel embarrassed to ride in that care because it would subtly shake with the typical Mercedes diesel engine idle at red lights. She didn't want to be seen "shaking" by any of her teenage friends in the old diesel Mercedes (spoiled rotten kid) -- we still make fun of her for that one. I really do think it's fascinating how the car we ride in becomes seen as an extension of our self-image - kind of second skin - and how we even anthropomorphise them, give them names, and feel genuine grief when we part with them. I'm so bad I sometimes feel "pain" for particularly pretty car with a nasty ding.